Discussion in 'Health' started by Seun Joseph, Feb 3, 2017. 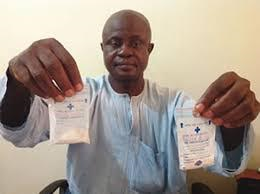 The Vice Chancellor of Michael Okpara University, Umudike, Professor Francis Otunta, has announced that a drug that cures HIV/AIDS has been discovered in the University. Otunta revealed to newsmen gathered at the campus that, following years of research, Prof. Maduike Ezeibe, a researcher at the university, made the discovery. The drug was presented to the University management and also to Ezeibe's colleagues in the medical field who didn't contradict his findings. Ezeibe, a professor of Veterinary Medicine and Clinical Virology, disclosed some of the components used in producing the drug; Aluminum Silicate and Magnesium Silicate (Synthetic Aluminum-Magnesium Silicate). The potency of the drugs was reportedly tested on 10 people living with HIV/AIDS. The drug was administered to them, followed by months of tests and the outcome was encouraging. Ezeibe revealed that the result of the tests has been published in scientific journals. To further authenticate the drug, Ezeibe presented his findings at the World Virology Conference in Atlanta and another held in Texas. So far, there has allegedly been no report to disprove the drug. Ezeibe went on to call on the Government to help secure international patency for the drug, now that it has been patented in Nigeria. He believes it could be a major foreign exchange earner for the country.